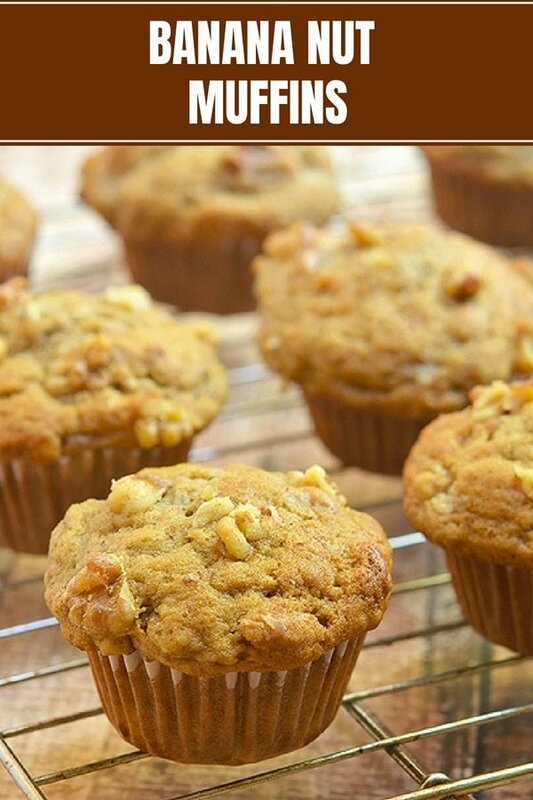 Banana Nut Muffins that taste like they came straight out of your favorite bakery! Moist, tender and bursting with fresh banana flavor and warm cinnamon, they’re the perfect breakfast or snack treat. G loves fruit, and every time we go to the grocery store, he would stock up on this fresh produce to enjoy throughout the week. The only problem is, his eyes are bigger than his stomach, and we always end up with fruits withering away on the kitchen counter. When I strolled into the kitchen this morning, I found a bunch of bananas already yellowing their way to the trash. 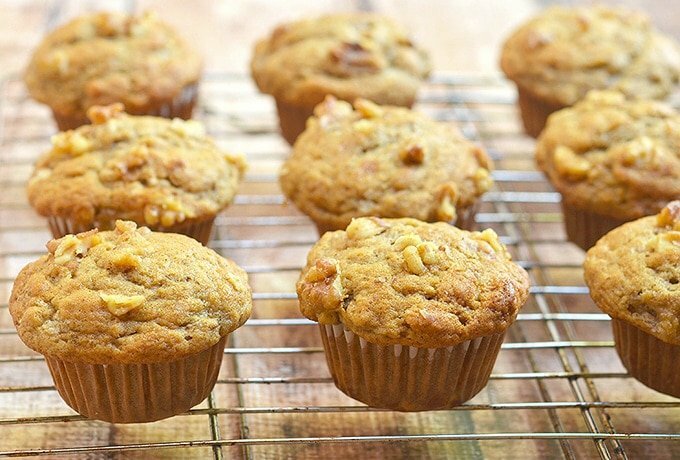 My cheap bum can’t stand any waste, but instead of nagging his ear off for buying more than he can consume, I decided to be nice and bake his favorite banana muffins with walnuts. I am not sure if it helped my cause because G enjoyed the muffins so much, he might “overbuy” again on purpose. 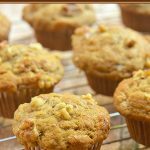 If you’re looking for the perfect breakfast or snack treat, this easy banana nut muffin recipe should be your next baking project. Moist and tender with golden muffin tops and intense banana flavor, they taste like they came straight out of your favorite bakery! They’re also super easy to make, you don’t even have to use a mixer! There are however a few simple steps to ensure success so please make sure to check out the tips below before you head to the recipe. Enjoy! Do not overwork the batter as this might cause peaked tops, tough texture and tunnels. Mix the dry and the wet ingredients in separate bowls and combine together just until the ingredients are moistened. Do not over stir to a smooth batter; a few lumps are fine. Use an ice cream scoop to easily and evenly portion the batter into the muffin tins. For extra depth of flavor, toast the walnuts. Not a fan of nuts? Swap chocolate chips in equal amount. 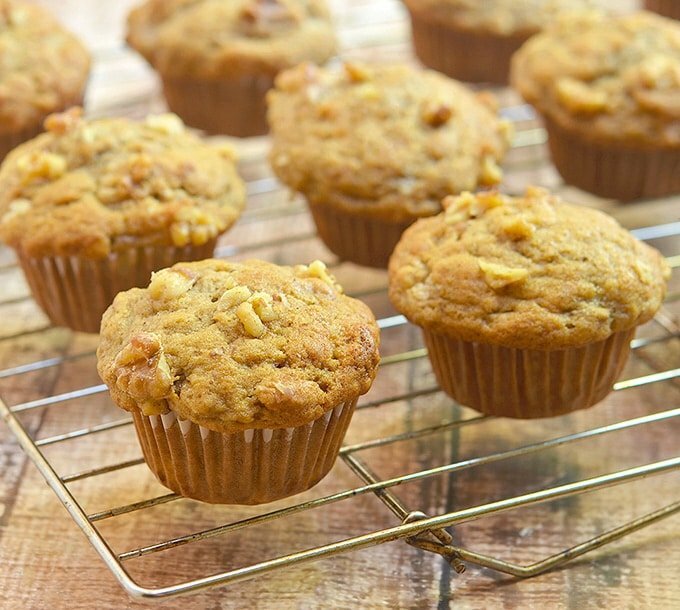 To store banana muffins for later, wrap individually in plastic film and then freeze up to 3 months. 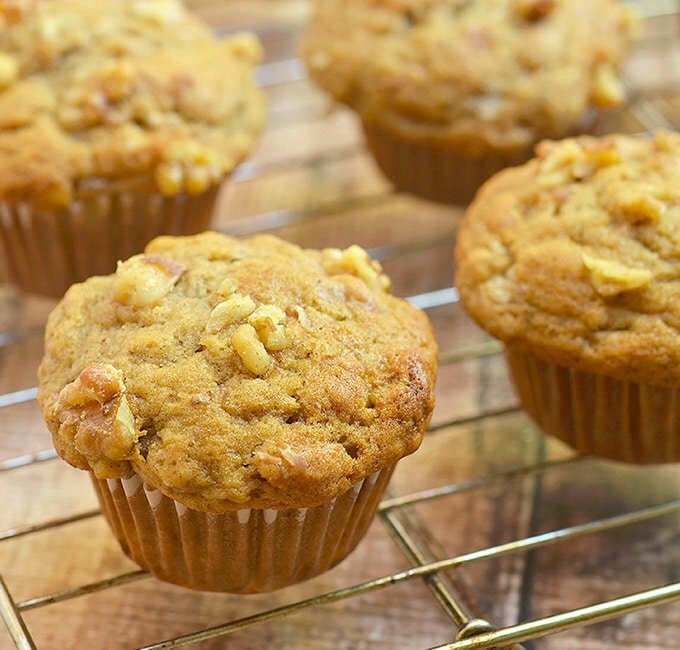 Banana Nut Muffins that taste like they came straight out of your favorite bakery! Moist, tender and bursting with fresh banana flavor and warm cinnamon, they're the perfect breakfast or snack treat. Preheat oven to 425F. Line muffin pan with baking liners. In a large bowl, combine flour, baking powder, baking soda, cinnamon, and salt. In a medium bowl, combine oil, white sugar, brown sugar, eggs, milk, vanilla extract, and bananas. Whisk together until well-combined. Add wet ingredients to the flour mixture. Using a rubber spatula, gently stir together just until moistened. Do not over mix. Gently fold in 1/2 of the chopped walnuts. Scoop batter evenly into prepared muffin pan up. Sprinkle with the remaining ⅓ cup walnuts. Bake at 425 F for 5 minutes. Reduce the heat to 375F and continue to bake for another 12 to 15 minutes or until a toothpick inserted in the middles comes out clean. Allow to cool for about 1 to 2 minutes and transfer onto a cooling rack. I am sorry to that. Was the batter overmixed? Hi ! Made this today. Onolicious! Yumminess! Not dry. Ah, I’m envious of people who can just decide on creating something at a snap of a finger as you did when you saw those bananas. will try to bake this for the long holiday! i both love banana and nuts together!! thanks for the recipe! 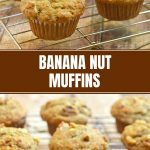 I’d love to try this banana muffins for my two kids. a yummy easy recipe. Thanks for sharing. I love making those muffins! They’re so easy to make and the fact that I use gluten free flour for them with no problem makes them even more amazing! 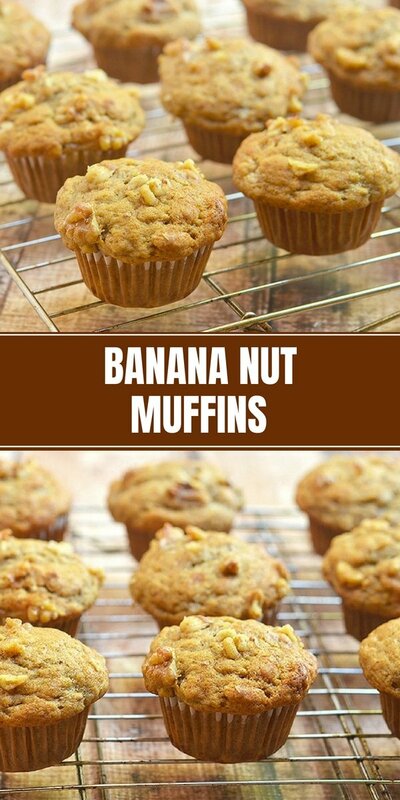 I LOVE banana nut muffins. These look so yummy. I had to pin this recipe! These look amazing!